I will admit it. By the end of the week, I am shot. I am too tired to do anything except sack out on the couch and watch television with the family. I don’t feel like cooking and I also don’t feel like running out to get anything for dinner. This leads to the scenario where my husband and I both look at each other and go, “So…what are you hungry for?” I then reply, “I don’t know, what you are you hungry for?” You can kind of see where this is leading, can’t you? Then we wait another five minutes and repeat the scenario…until someone gives in and breaks out the cereal. It is a sad, sad situation we have going over here in our house. I am trying to break this cycle so I have our dinner in a bag…literally. 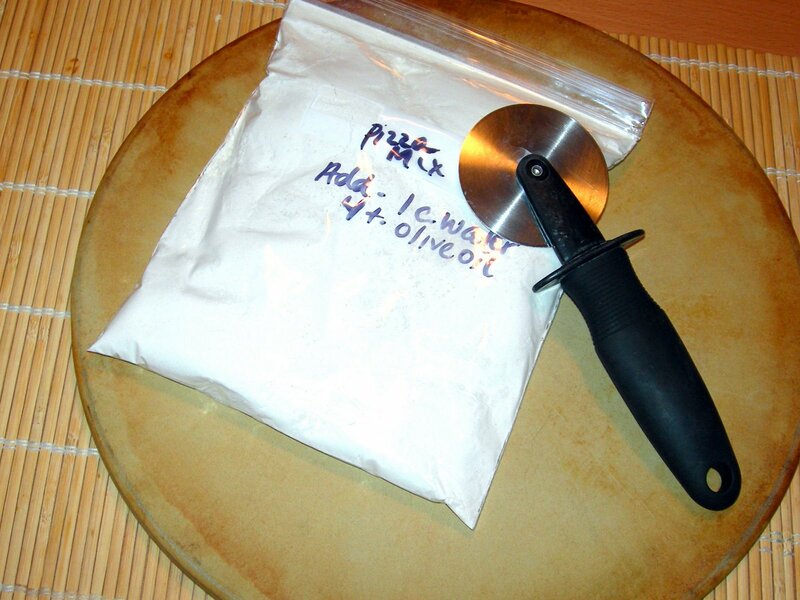 I decided to mix up my newest edition to the fifty thousand pizza dough recipes I have and throw it in a bag. I marked it with, “Pizza Mix” and wrote down the two liquid ingredients that needed to be put with it. All I will have to do on Friday night is throw in the bag, add the water, add the oil and hit dough cycle. Since I was making one of the mixes, why not four? So now I have mixes for every Friday night this month and it took ten minutes to do this. This recipe yields enough for two thin crust pizzas or one thick crust pizza. I prepare one of the pizzas as a…um…pizza. The other recipe is made into breadsticks. I can’t take credit for this one because it comes courtesy to you from my girlfriend (Becky- thanks!) For my breadsticks, I drizzle a little olive oil on top, and sprinkle with dried parsley and garlic salt. I then prepare my sauce (enough for three pizzas) and we dip our breadsticks in the sauce and enjoy a homemade pizza. You might want to incorporate this little recipe into your family night this week. It is easy as pie and *so* good! Put all ingredients into your bread machine per your manufacturer’s instructions. Choose your Dough Cycle. When the pizza dough is done, punch down and roll out onto a floured surface. Cook the pizza in a 425 degree oven for fifteen-twenty minutes. Bring the mixture up to a simmer and cook for twenty minutes. Allow mixture to cool before pouring on top of the pizza.